The last few days have been rich, rich in food, activity, and kids, my own and my grandkids. My daughters May and Anne, plus my son Michael have been visiting, plus Michael's partner Micah. Anne's Husky. Lukah came along for the fun. A good time has been had by all. I am still recovering from my broken ribs, so Anne, a professional cook, brought me special soup-broth for healing, and proceeded to cook her incredible Italian meat balls and spaghetti. My granddaughters, three-year-old Emma and going on one-year-old Iris, were here and the action was non-stop. I even volunteered for a game of Snake Oil with the crew and managed to win five rounds. For a non-gamer, that was pretty good. Last night, the adults watched one of my favorite movies, "Divergent," which lasted almost till midnight, after which I assumed the one position I can sleep in these days and slept as long as I could. I am getting better. 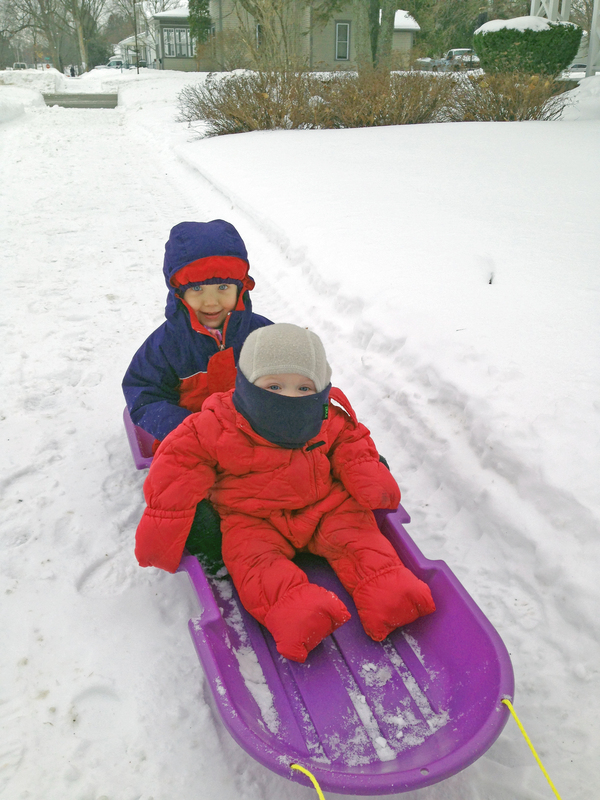 Here is a photo of Emma (in the back) and young Iris (up front) on a sled run. Everyone has gone back home, but May and Iris are staying for some additional time, which will be fun for all. Grandkids are so…. special!